HTC has finally confirmed its HTC One Max has a LCD panel up to 5.9 inches and features a fingerprint scanner on its back side. The One Max weighs 217 grams and is just over 16cm long. Thanks to its front facing BoomSound speakers, it measures 10.3mm thick. The HTC’s One Max’s fingerprint scanner allows its users to log in with just a swipe of their fingertip. The fingerprint scanner is programmable for up to three separate fingers. This allows the instant launching of up to three separate apps without requiring unlocking or heading to the home screen. The fingerprint sensor can also unlock the phone. It is located on the back of the device just beneath the camera lens. The back cover is removable and allows it user to expand the 16GB or 32GB of onboard storage up to 64GB more through microSD. The One Max features a Snapdragon 600 camera with 2GB of RAM. The supported bands have healthy support for LTE networks in Europe and Asia, as well as for both Sprint and Verizon in the United States. According to HTC global availability will start rolling out next week. The phone features Sense 5.5, a mild upgrade to the company's Android skin, which adds a new level of customization for BlinkFeed. The smartphone is offered in silver and will be available globally in mid-October. The rollout will continue until the end of October when specific launch dates will be announced for individual regions. 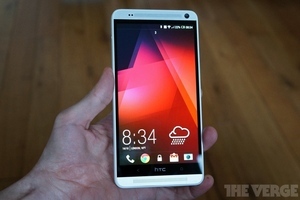 The company has not disclosed a price for the HTC One Max at this time.